Lighthouse's Young Writers Camps are led by published and award-winning writers, and each workshop is designed to foster creativity, self-expression, and excitement about writing. Half-day, full-day, and extended day options are available for all age groups throughout the summer. Camps will run June through August. Registration for half-day camps and applications for full-day camps will open January 1, 2019. 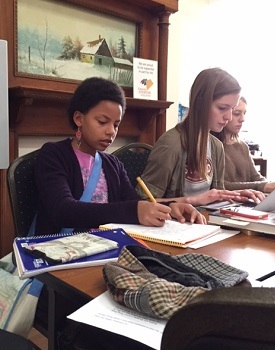 Our half-day camps offer small groups of six to 12 students and focus on a specific writing genre or topic. Lunch care is available each week. 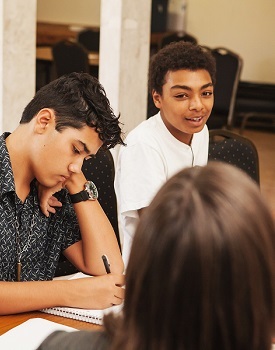 Our full-day Summer Writing Camp allows young writers to explore a variety of genres and topics with several local authors throughout the week. Camp week ends with a public reading where each camper can share a piece of writing from the week. An application is required. Summer Writing Camp for grades 6-8 will be held July 22-26, 2019. Applications open January 1, 2019. Before and after care are available. Our full-day Summer Writing Camp allows teens to explore a variety of genres and topics with several local authors throughout the week. Camp week ends with a public reading where each writer can share his or her original writing. An application is required. Summer Writing Camp for grades 9-12 will be held July 29-August 2, 2019. Applications open January 1, 2019.